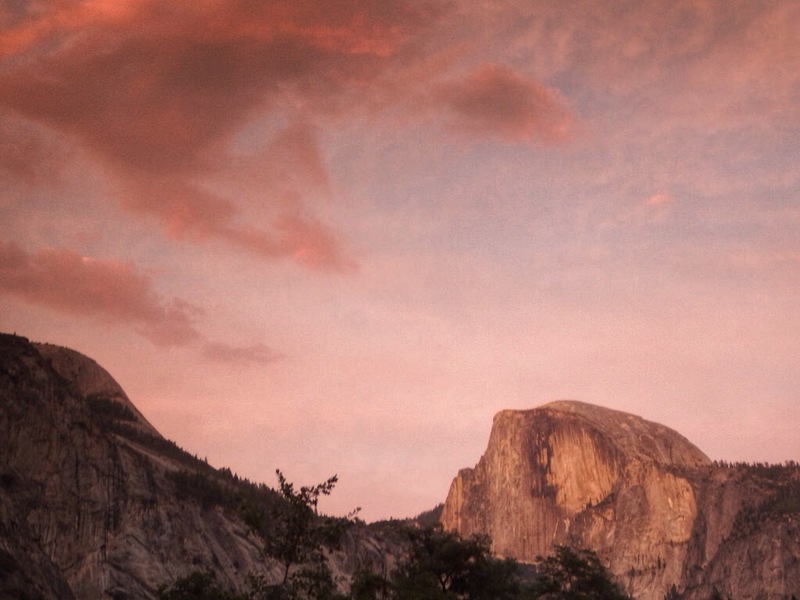 There are three shuttles that run to Yosemite every day; however only one of them go all the way to Yosemite Valley. The remaining two terminate at Tuolumne Meadows. So in reality we could have slept at least an hour longer but since we decided to stop at Tuolumne first, we are up at 6:20 a.m. and ready to check out just before 7:00 a.m. We grab coffee and chai latte and some pumpkin bread at the Latte da Coffee Cafe, which is adjacent to the El Moo Motel and head to the YARTS (Yosemite Area Regional Transportation System) shuttle stop about a block away. The shuttle ride is pleasant, offering great views of the mountainous terrain. After 40 minutes we arrive at Tuolumne Meadows. We have just enough time to visit the Grill and walk a mile to the visitor center to buy and mail some postcards before we have to return to the shuttle stop. The air is not too hazy but we can smell smoke in the air. Normally I would associate this scent with a pleasant bonfire and roasted sausages. This bonfire however is burning on 3400 acres and 1400 firefighters are tending to it. We are saddened by the loss of such a vast area of beautiful forest but we are also happy that the fire does not bring any change to our plan as it is burning in an area not directly affecting the JMT. The next YARTS bus is supposed to arrive at 10:15 a.m. When there is no sign of it at 10:25 we start to worry that we might have missed it somehow. Luckily for us it is just running little late. Once again the ride is smooth and the views are getting even better. Behind us sits a couple returning to their vehicle parked in the Valley. They got stuck in a stormy weather and after several days of heavy rain they gave up and left the trail about 70 miles short of Whitney. It is sunny and close to 100 degrees. It is hard to imagine any prolonged period of rain. Once we have our permits, which is an easy task involving a fifteen minute chat with a friendly ranger at the Yosemite Valley Ranger Station, we hurry to secure our spot at the backpackers camp. There is plenty of space when we arrive. 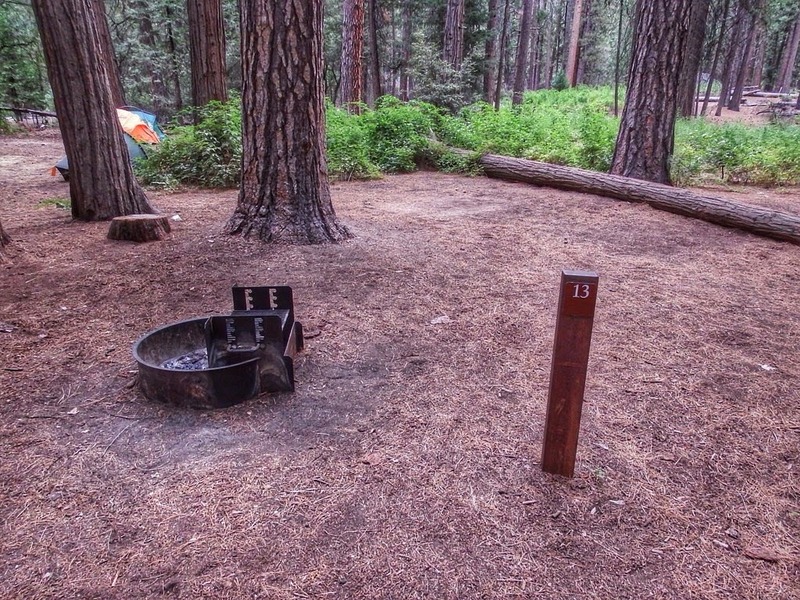 There is no potable water at the backpacker camp but nearest source is only about 5 minutes away at the Pines Campground. Yosemite Valley has a great shuttle system. 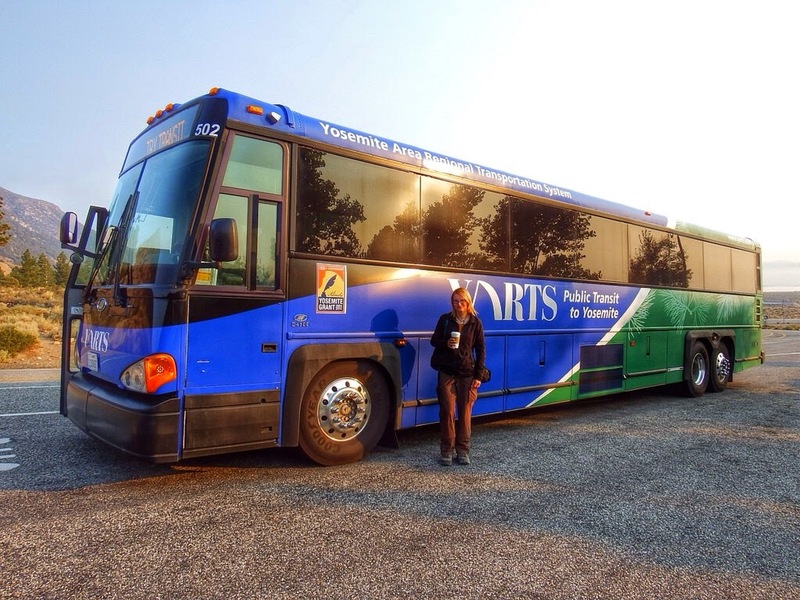 Not only you can take YARTS to the Valley, you can then take the smaller shuttle buses to get around the Valley. These shuttles run a one hour loop, hop on and off at your leisure, and they are completely free. When our camp is set up for the night, we take advantage of this shuttle system and return to the village for lunch and sight seeing. Then we take the shuttle all around the Valley and continue second loop back to stop # 6 which is perfect for sunset photos. 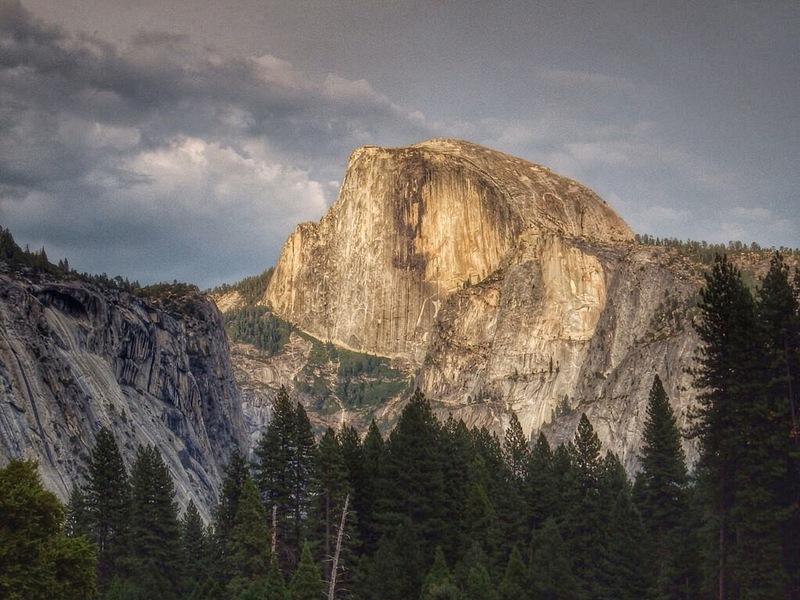 A view of Half Dome across an open meadow lures us for a pre-dusk stroll. We make a few step towards a bridge over a peacefully flowing Merced River when Dave pointed across the water. Finally a bear. Yosemite Valley is known for its bears and I was looking to catch a sight of one ever since we arrived. 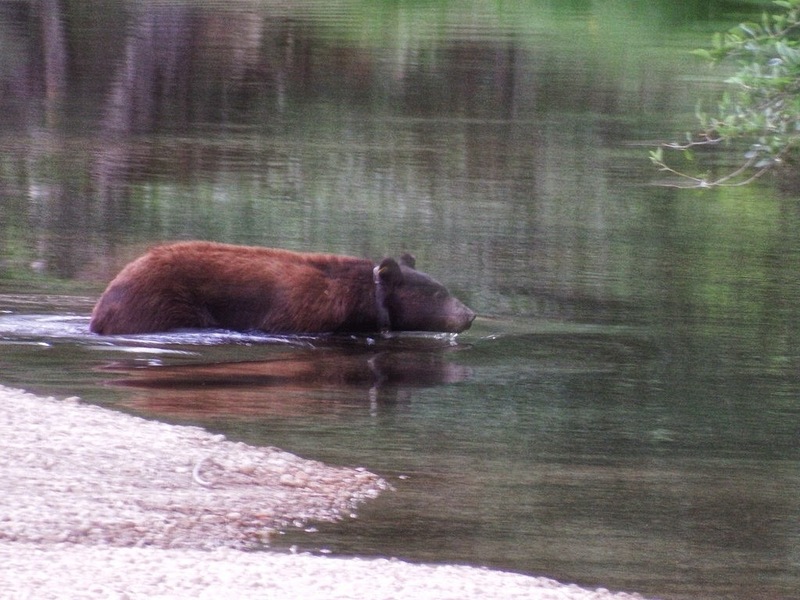 The bear makes it to the bridge but when he sees us, he continues further downstream where he crosses over. I’m positive he would have used the bridge if it wasn’t for us standing near it. Washington has a healthy population of black bears but most of times you see them stationed in a berry field far away from the trail. This one we see from up close and it is active, walking around and swimming. It is a neat experience. The evening brings pink color to the sky as the sun set behind the curtain of smoke. The air quality in the Valley is good, I hardly can detect any smoke at all. I am happy about it. Even though the fire is not directly threatening the trail, presence of smoke could easily make our hike unpleasant. Speaking of a hike, we are so excited, we find it hard to fall asleep in the night. The hot humid evening is not helping either. We are ready for some fresh mountain air. Tomorrow we set out for our journey and I will face one of my biggest fears.